Ruptured stomach is rarely met with in young horses except as a result of extraordinary violence when the stomach has been greatly distended by food. In many cases the mishap is preceded by structural changes inducing dilatation and weakness of the walls. These may have -resulted from a former gastritis, acute or chronic, or from habitual distension in overfeeding, or from the protracted use of bulky and innutritious food, as is so often the case with farm-horses fed upon indifferent provender and other unsaleable products of the farm. Severe work on a full stomach is not rarely responsible for this disease. 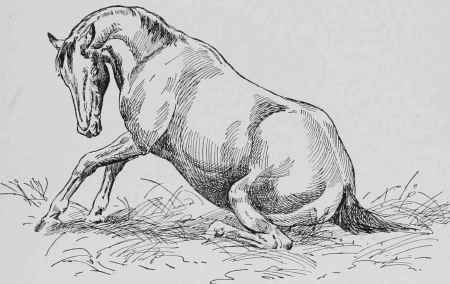 Heavy draught-horses are the more frequent subjects of this lesion, though it may, and does, occur in horses of all classes. The work of the draught-horse is not so well-regulated as that of the lighter breeds, nor is his attendant, as a rule, as judicious a feeder as that of the hackney or hunter. Fig. 99. - Ruptured Stomach. A correct diagnosis of this lesion during life is seldom possible, even to the most experienced practitioners, as many of the symptoms resulting from the accident are common to rupture of other important parts of the alimentary canal. Although vomition is often a leading symptom, it is too frequently absent to be regarded as a reliable indication of the disease. Experts are not in agreement as to whether rupture of the stomach precedes or follows the act of vomition. While some are of opinion that vomition does not occur while the viscus is intact, others hold that a stomach, rent and permitting its contents to escape into the abdomen, would not be capable of exercising that forcible contraction which precedes the ejection of its contents in an upward direction. When rupture of the stomach occurs as a sequel to engorgement, there are the usual manifestations of acute abdominal pain, such as pawing and stamping, getting up and lying down, rolling, looking round at the flank, etc. (fig. 99). These are soon followed by less active symptoms, when the patient stands with haggard and anxious countenance; the breathing becomes shallow, the extremities cold, the visible mucous membrane blanched, and the pulse fluttering and feeble. There is now a general appearance of impending dissolution, which those familiar with animals may recognize readily if not describe. The temperature, which may have run up quickly, now falls, and with it comes a trembling, tottering gait, sighing, and perhaps sweating. In this stage of the disease the animal soon collapses, but remains on his feet till he falls dead, or dies after a few convulsive struggles.